Last night, we located what is perhaps the worst Mexican restaurant in the world... well, at least in Prague. I pass the Calvera Bar & Restaurant just about every day on my way to and from work, and curiosity finally got the best of me. It looks like one of those places that might be a hidden gem - one of those "hole in the wall" restaurants that you take your friends to to impress them with your insider knowledge of Prague. So - with high hopes, and tummies yearning for good salsa, we stepped under the faux stone archway decorated with skulls, and found a table by the bar. 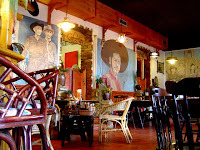 We decoded the Czech menu enough to make our order, and sat back to enjoy the ambiance - the walls were decorated with murals and framed photos of famous western movie stars. Cowboy nick-knacks swathed in greens, yellows and reds dominated the crowded room. So far so good. Then the food arrived. We should have known we were in trouble when we saw the array of condiments placed at each table - bottles of Worcestershire Sauce, Soy Sauce Extra Virgin Olive Oil and "Mexican Ketchup" complemented the Heinz chilli sauce. Erin's Tortilla plate arrived first... some dry chicken, topped with a tortilla, topped with a dollop of melted cheese. Ten minutes later, our appetizer arrived. The "Nachos con gusto" consisted of grated mozzarella cheese, tossed with a bowl of tortilla chips. Yum! Finally, just as Erin was polishing off the remnants of her cheesy tortilla, my fajitas arrived. By now, I was starving, and I dug in with gusto... to what is probably best described as sweet & sour chicken wrapped in a warm tortilla. No wonder there was a bottle of Soy Sauce on the table! Oh - I forgot to mention the "Strawberry Margarita." Fortunately, I secretly kind of like cough syrup. That's what this drink reminded me of. A nice, fruity, red cough syrup, poured over ice, with a lemon stuck on top. We escaped Calvara with Czk 590 ($35) in damages, and headed out for greener pastures to find dessert. Fortunately, the delights of a springtime Prague evening awaited! Prague in the springtime is a magical place... all over town, tables are appearing on sidewalks, people are lounging on blankets in the parks, and trees are blooming. After a walking tour through the back alleys of Mala Strana, we climbed the hill to the imposing Strathov Monestery. The BellaVista Restaurant definitely lives up to its' name -- Beautiful View. The panorama view of Prague at twilight was ...bella! Gelatto and cappuccinos were ... buono! The price was... well, let's just say we paid for the view! Where: Corner of Malá Štupartská and Týnská in Old Town. Looking for a place for the kids to run off a bit of extra energy while the "big kids explore the Gothic architecture of Prague's Old Town? Look no farther than the creatively named "Dětské Hřiště" or "Children's Playground," just a couple of blocks away from the famous Astronomical Clock of Old Town Square. You really have to know this place is there to find it. It's worth the extra search though! The playground is hidden in an an urban canyon - tucked behind a fenced-in football pitch, and invisible from the road. A residential building forms two walls of the park, and a brightly painted mural the third. The play equipment and sandbox is new and well maintained, and the entire playground is covered with a rubber surface to save those little knees from all but the most tragic of falls. There's a limited amount of parking in front of the playground, but driving through the warren of one-way streets around Old Town is never fun. Public transport to either Staroměstská or Náměstí Republiky gets you to within about 3/4 of a kilometer from the park. Make sure you have a good map with you as you navigate through the narrow streets and alleyways leading out of Old Town Square. When you get to the "T" corner of Malá Štupartská and Týnská, turn around (facing East) and you'll see a small soccer field (with an artificial surface) surrounded by a chain-link fence. Go through the gates to the right of the field, following the signs to Dětské Hřiště. The playground is hidden out of sight, behind the soccer field. Hungry after trying out all the playground equipment? Treat yourself to one of the many international food offerings on the top floor of the Palladium Mall - just above the Náměstí Republiky metro stop. The restaurants of the Patro Gourmet aren't cheap... but they sure do taste good... and the gelato stands on the ground floor offer the best ice cream I've tasted outside of Italy! Have you ever had a really strange dream? One filled with odd images, weird figures and stories that make perfect sense - but only while you're still dreaming? Maybe they're fueled by bad curry. Maybe by stress. 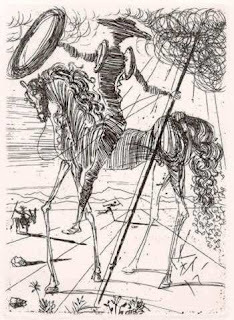 Whatever caused the weird dreams, Salvador Dali must have had a lot of them... and then remembered them well enough to paint them as well! 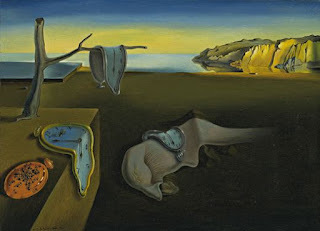 I guess they don't call him a surrealist for nothing! Spring is springing into full force here in Prague. This means not only the flowers are blooming and the sun is shining more, but also that tourists are popping up all over Prague in the busloads! We walked across the Charles Bridge, dodging packs of tour groups, heading towards Old Town Square through the quiet courtyards of the Klementinum. We'd seen the sign advertising the Salvador Dali exhibition at the Gallery of the White Unicorn for months now - and decided that tonight was the night to finally get around to visiting it! The collection was pretty large - a combination of paintings, prints, ceramics and even some small sculptures, as well as a collection of photographs of Dali, taken in Paris by Czech Photographer Václav Chochola. Well worth the visit and the Czk 150 admission fee. Our appetites worked up by the weird weird art, we headed off to find some grub. Not being especially good at planning these things ahead of time, our dinner selection was the first thing that caught our eye from the current issue of Prague in Your Pocket. Unfortunately, that first thing was U Musketyra (At the Muscateer). 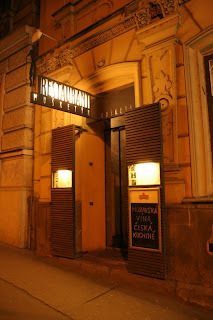 Just down the road from the National Museum at the top of Wenceslas Square, the restaurant is easy to miss unless you're looking for it. The basement was dark and a little dingy... decorated with fake wooden shields and swords. Service was decent (and even in English)... but the selection was pretty slim - no goulash to be found, despite the advertisement for "Moravian Wine, Czech Cuisine" outside the restaurant. The garlic soup was tasty, but the cheese plate consisted of a slab of butter just about as large as the three varieties of bland cheese. We settled for two plates of just average Pork and dumplings, and left without too big of a dent in our wallet (Czk 500 for appetizers, entrees and drinks). Surreal art, followed by real food. Not a bad night out!